A silver lining exists in the dust cloud being beat up by the marching feet of millions of Muslim men migrating into the West: those many Europeans and Americans, who could never understand Islam in theory, will now have the opportunity to understand it through direct and personal experience. Perhaps then they will awaken to reality? The fact is, most Western people have had very little personal interaction with Muslims. 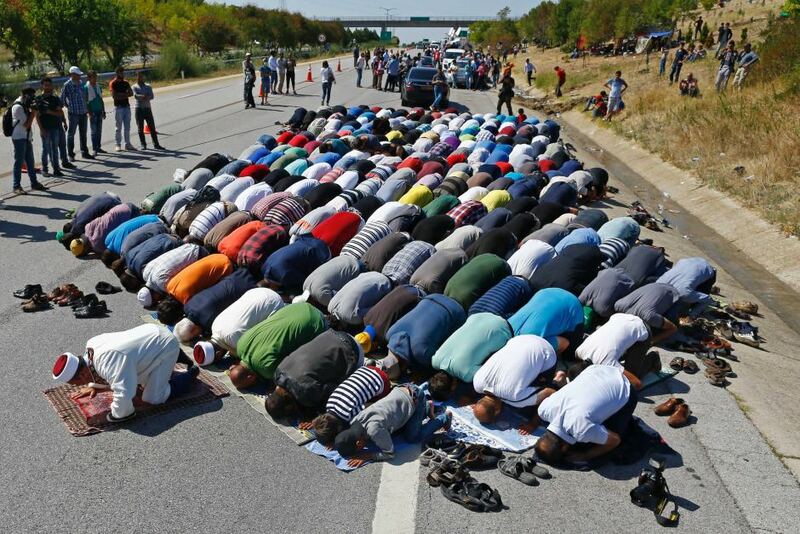 Moreover, because Muslims in the West are still a tiny minority—in the U.S., they are reportedly less than one percent of the population—those few Muslims that Westerners do interact with are often on their best behavior, being surrounded as they are by a sea of infidels (according to the doctrine of taqiyya). And although there are a few media outlets and websites that document the hard but ugly truths of Islam, these are drowned out by the overarching “Narrative” that emanates from the indoctrination centers of the West (schools, universities, news rooms, Hollywood, political talking heads, et al). According to the Narrative, there is nothing to fear from Islam. If violence and mayhem seem to follow Muslims wherever they go—not to mention plague the entire Islamic world—that is because Muslims are angry, frustrated, and aggrieved, usually at things the West has done. Although Islamic doctrine calls on Muslims to have enmity for and strive to subjugate non-Muslims whenever possible; although Muslims initiated hostilities against and were the scourge of Europe for a thousand years, until they were defanged in the modern era; although most of the so-called “Muslim world” rests on land that was violently seized from non-Muslims; although reportedly some 270 million non-Muslims have been killed by the jihad over the centuries; and although many modern day Muslims maintain the same worldview that animated their ancestors—most people in the West remain ignorant. In this context—or absolute lack thereof—how is the average Western person to know the truth about Islam? Enter mass Muslim migrations. That is, let the barbarians at the gate in. I speak not of the true refugees—women and children—but of the hordes of young and able bodied Muslim men; the ones shouting “Allahu Akbar!” as they barge into Europe. When discussing Western and Muslim interactions in the modern era, it’s my custom to provide historical precedents to show that Muslim hostilities—whether hate for Christians and their churches and crosses, or whether violent lust for “white” women—are not aberrations but continuations. In this case, however, I have none to give. For never before in history have the peoples of one civilization been so divorced from reality as to welcome millions of people from an alien civilization—one that terrorized their ancestors for centuries—to come and dwell among them. The only “history” one can cite is the modern day experiences of those European regions that already have significant Muslim populations, and are taking more in. The price of the Islamic influx into Western lands is violence and chaos, in accordance with Islam’s Rule of Numbers: women and children will be exploited and raped; the elderly will be mugged; churches and other institutions will be attacked; terror will set in. Look to the plight of non-Muslims living alongside Muslims to get an idea of what is coming. But alas, at this late hour, such appears to be the price that must be paid for decades of willful ignorance. If the West cannot learn the truth about Islam from theory, from doctrine, from history, and now even from ongoing current events, then let it learn from up close and personal contact. And if after such firsthand experiences, any Western nation is still too politically correct to act in the name of self-preservation, then let it die. For it will be evident that there is little left worth saving. Filed Under: Islam, Other Matters Tagged With: Europe, Islam's Rule of Numbers, refugees, U.S.